Nickelodeon's fan-favorite animated series Hey Arnold!, which burst back onto screens (and back into hearts) this fall with the long-awaited Hey Arnold! The Jungle Movie, is coming to DVD on February 13, 2018. Hey Arnold! 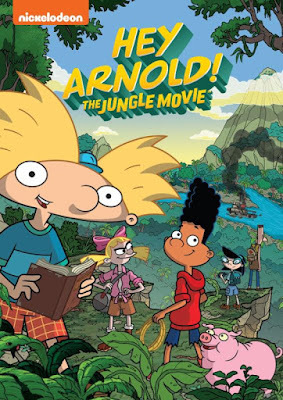 The Jungle Movie features a storyline that picks up where the original TV series ended in 2004, following the kids on the field trip of a lifetime, where Arnold and his friends embark on a quest to achieve his dream of finding his missing parents. Hey Arnold! The Jungle Movie resolves unanswered questions and plotlines--including Arnold finally getting answers about the whereabouts of his missing parents and provides all of the humor, and friendship that made the original series such a long-standing fan-favorite. Produced by Nickelodeon Home Entertainment and distributed by Paramount Home Media Distribution, Hey Arnold! The Jungle Moviewill be available on DVD February 13, 2018, for the suggested retail price of $13.99.